The View From Khan Shaykhun: A Syrian Describes The Attack's Aftermath : Parallels "Their faces had turned yellow and they had stopped breathing," a Syrian activist tells NPR. "As I'm describing the incident to you now, my hands are shaking. No, my whole body is shaking." 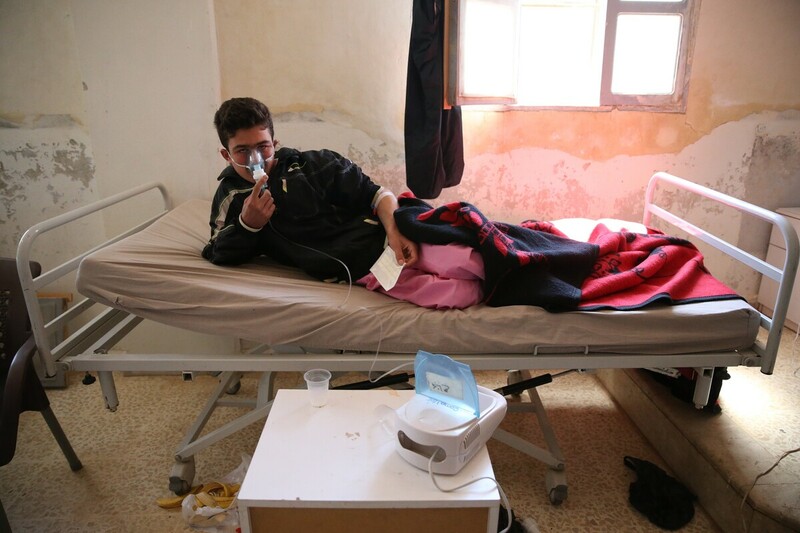 A survivor of the suspected chemical attack receives treatment at a hospital in Khan Shaykhun on Wednesday. As they had many times before, he and other activists planned to document what happened, record the names of the victims and try to get the word out. Six years after they started protesting against President Bashar Assad's rule, this is what much of their opposition activities have come down to. Before reaching the town, just a few miles away, it became clear this was no ordinary strike. Fellow activists in Khan Shaykhun, communicating via walkie-talkie, warned them that the bombs had released chemicals. They heard the word "sarin" — a toxic nerve gas — and pulled over. "We were afraid of inhaling the smoke. We didn't want to die, to be honest," Hussein told NPR in a conversation over the WhatsApp messaging app. They waited for about 15 minutes, until they saw the flood of victims being evacuated past them. Then they decided to venture in. "I saw something I'd never seen in my life," Hussein said. "Dozens of children, women, men and elderly people lying on the ground, getting hosed down with water, out in the cold. Children trying to breathe a gasp of air, with saliva and foam coming out of their mouths and nostrils." Hussein wept as he watched first responders succumb to the chemicals themselves. He frantically searched for a ventilator for one of the children, but in those moments when he was looking, he says, "was the difference between life and death." He says he saw entire families being pulled from their apartments, lifeless. The strikes came just at daybreak, he said, "before the children would be leaving for school or the parents for work." Dumbstruck and with little else to do, Hussein covered victims with blankets, to give them a measure of dignity. They showed no signs of outward wounds or blood. The World Health Organization says its partners on the ground counted at least 70 fatalities, people who died of apparent exposure to "highly toxic chemicals." Hussein shared a list of names compiled by activists, typed painstakingly in Arabic: 74 victims. Twenty-one were children. Hundreds of others suffered from the effects of toxic chemicals in the aftermath of the attack. WHO said area hospitals were unable to handle the flood of victims, and dozens were transported across the border to Turkey — more than 80 miles away — for treatment. That in itself was an ordeal, activists said, with some of the wounded waiting hours to cross the border. WHO said that two area hospitals, which should have been able to treat the victims, had been "damaged" — one on Tuesday, the day of the attack, as it received victims, and the other on the previous Sunday. 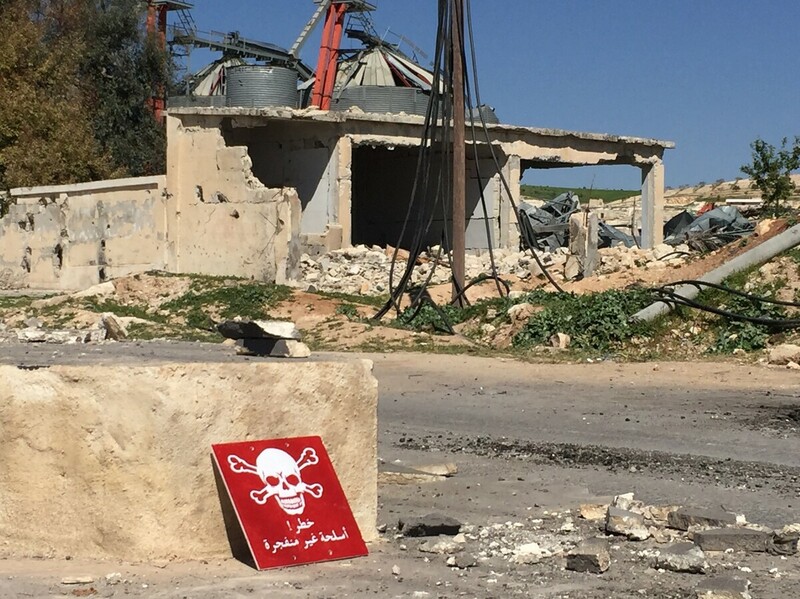 A poison hazard danger sign is seen in the town of Khan Shaykun, Idlib province, Syria. At least 70 civilians, including 20 children, were killed in a suspected chemical attack in the town. Hussein said Russian warplanes were to blame for targeting Khan Shaykhun's only hospital hours after the initial attack and returning to bomb the town's civil defense center, from where first responders work. He had been to the civil defense center just hours before, watching in horror as rescue workers stripped the wounded before they tried to hose off the toxic substance. "Some of these people, their faces had turned yellow and they had stopped breathing," said Hussein. "As I'm describing the incident to you now, my hands are shaking. No, my whole body is shaking. We were all shaken by what we saw." President Trump has blamed Assad's forces for the attack. U.N. Ambassador Nikki Haley threatened that the United States could act unilaterally if the Security Council wasn't willing to take action. Syria's military has vehemently denied using chemical weapons in Khan Shaykhun or in any previous attack. For those on the ground, the harsh statements and the denials brought back memories of 2013, when a sarin attack against the rebel-held suburbs of Damascus nearly provoked a U.S. strike. Syria agreed then to give up its chemical weapons stockpile — which it had never admitted possessing — under a U.S.- and Russia-brokered deal. In the years that followed, allegations of smaller-scale chemical attacks have persisted, mainly involving chlorine — which is not banned because of its hygienic uses. The U.N. and the Organization for the Prohibition of Chemical Weapons have been tasked jointly with investigating those allegations. The U.N.-OPCW mission says it is in the process of investigating the new allegations. Meanwhile, Syria's conventional war grinds on. On the same day that residents of Khan Shaykhun were suffocating to death, the opposition-leaning Syrian Observatory for Human Rights reported that 34 people, most of them women and children, were killed in airstrikes elsewhere in Idlib province, while rebel factions, led by a former al-Qaida affiliate, pressed an offensive against government-held areas of neighboring Hama province and shelled two isolated, pro-government villages in Idlib. Syrian government forces are in a better position than they've been in years, seizing back territory with help from Iran and Russia, powerful allies. Rebels have been pushed into surrender deals from Aleppo to Homs, and opposition fighters have been evacuated with their families and peaceful dissidents to northern, rebel-held territory. But that territory, dominated by jihadist factions and under regular attack from the air, offers little freedom or security to civilians. Hussein says Syria needs a durable accord between all parties. "At the end of the day, as Syrian people, we have lost a lot," he says. "We've lost our children, our women, our country as a whole. It's something hard to put into words."